Students aged 9 through adult learners, age 8 with approval, will have a chance like never before. 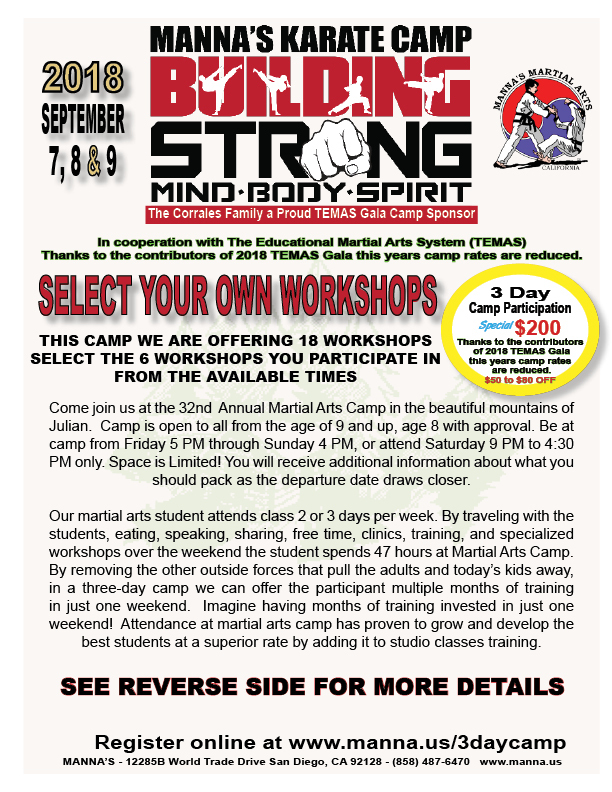 Manna's and TEMAS will be bringing a Build your own Course Weekend, where each camp participant will have the ability to create thier own experiance. Grandmaster Brian Manna began his Martial Arts journey in 1972 following his lifelong passion of guiding individuals and Instructors in the martial arts. Grandmaster Manna is the founder of Manna’s Martial Arts, VMAL, TEMAS and system developer of Songin Do. He is a graduate of the SD FBI Citizen’s Academy and former Infragard Sector Chief. Grandmaster Manna will be leading evening workouts featuring team building and awareness. Sr. Master Chris Brandt started his training at the Westwood Club in 1985 at the age of 10 as one of Grandmaster Manna's first students. Master Brandt received his black belt in 1989 and has maintained his expertes in Tang Soo Do and Hapkido and specializing in nunchaku skills. Master Brandt will be conducting a nunchaku weapons workshop and teaching Tang Soo Do forms. Sr. Master Janet Manna received her black belt in 1990 as a direct student of Grandmaster Manna and continues to set the bar for power, balance and focus. Master Manna is the director of one of the most recoognized children's martial arts programs in the nation. She will be teaching the staff workshop and teaching Tang Soo Do forms. 4th Degree Sue Huey received her black belt in 2008 as a direct student of Grandmaster Manna and continues to set the bar for power, balance and focus. Sue Huey is the Assstant Director of the early education programs at Manna's supporting one of the most recoognized children's martial arts programs in the nation. She will be teaching development workshops and teaching Tang Soo Do/Songin forms. Training in this build your own course weekend is a phenomenal opportunity making this 31st anniversary camp experience a special one for each attendee. Our martial arts student attends class 3 days per week. By traveling with the students, eating, speaking, sharing free time, clinics, training, and specialized workshops over the weekend the participant spends 47 hours at Martial Arts Camp. By removing the other outside forces that pull today’s kids away, in a three-day camp we can offer the student multiple months of training in just one weekend. Imagine having a month of training invested in just one weekend? Attendance at martial arts camp has proven to grow and develop the students at a superior rate than in studio classes can alone. For those reasons, we want to share how important this is to us and we want to share the chance to interact with students, Senior Black Belts and make all of this available to assure our 31st Anniversary Camp will be one not soon forgotten. Our martial arts student attends class 3 days per week. By traveling with the students, eating, speaking, sharing free time, clinics, training, and specialized workshops over the weekend the child spends 47 hours at Martial Arts Camp. By removing the other outside forces that pull today’s students away, in a three-day camp we can offer the student multiple months of training in just one weekend. Imagine having months of training invested in just one weekend? Attendance at martial arts camp has proven to grow and develop the students at a superior rate than in studio classes can alone. Plain ahead! You are invited to join in special event and be a part of our 30th Annual Karate Camp specializing in Grandmaster Clinics, in the beautiful mountains of Julian. Camp is open to all starting at the age of 9, (8 with special approval), clinics and activities for teen and adult only. Lodging, meals, and all special activities. Round Trip from MANNA'S if needed, you may elect to carpool. (World Trade Drive studio location). Drivers depart Manna's on Sept. 7th, at 4:15PM, or you may drive to camp for diner at 5:00PM. Return to Manna's Sep. 9th at approximately 4:00PM, or depart from camp after 3:15PM. Be involved in this special event, mountains of fun, REGISTER NOW. There is an optional one day, September 8th,of participation, 9AM to 4:30PM (Lunch included). GET READY for mountains of INFORMATION & FUN you will never forget! The ability to offer such a high standard in training can only happen with the support of our key donors. Each Grandmaster’s cost is in the thousands of dollars. The addition of these world-class athletes is a phenomenal opportunity and one that we are communicating with those who we see as a good fit for offering sponsorship. Please aide with your sponsorship/donation making this 30th anniversary camp experience a special one for each attendee. See Sponsorships Levels. Please be reminded that every penny counts. All gifts/donations to TEMAS are tax-deductible to the fullest extent of the law. We would like to thank you in advance for your generosity. Your donation assures a successful 30th Anniversary Camp, bring in guest Grandmasters, offer the AMZAING in-studio training, and continue to put smiles on the face of children as they are guided by our TEMAS 3 principles; Justice (The use of authority to uphold what is right, fair or proper), Sincerity (The act of being truthful, honest and genuine), and Responsibility (Obligating one’s self to a cause or purpose, distinguish between right and wrong). We wish to offer our gratitude for your consideration to these unbelievable opportunities of giving. All TEMAS donations are tax deductable. Copyright © 2018 MANNA'S. All Rights Reserved.